Barry Ween: Boy Genius follows the comical escapades of a 10-year-old boy who secretly possesses the most powerful intellect on Earth (IQ of at least 350), along with his impulsive best friend Jeremy and his crush Sara. Barry puts his genius to work primarily in creating outlandish inventions that are centuries ahead of their time, such as teleportation devices, jet-packs and wallet-sized nuclear devices. Many of the story-lines involve one of Barry's inventions going horribly wrong (usually due to Jeremy's clumsiness) and the two boys' efforts to right the situation before anyone can find out. Barry takes great care to keep his genius a secret and maintains Jeremy as his only confidant. 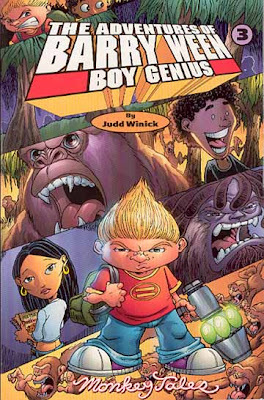 My friend bought Judd Winick's book Barry Ween: Boy Genius and absolutely fell in love with the book. I was a little skeptical when he gave it to me to read. 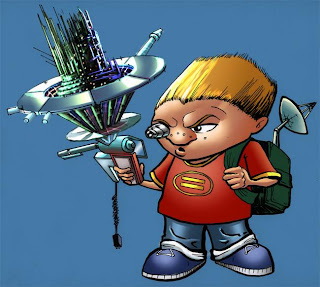 The premise of the book seemed unoriginal and the character of Barry Ween looked very similar to Bill Watterson's character, Calvin. I couldn't been more wrong about Winick's book. First, Winick's art was perfect for this book. It did resemble Bill Watterson's work in the Calvin and Hobbes but the style fit the dialogue and the characters perfectly. After reading it, I could not imagine Barry, Jeremy, Sarah or Roxie looking any different. 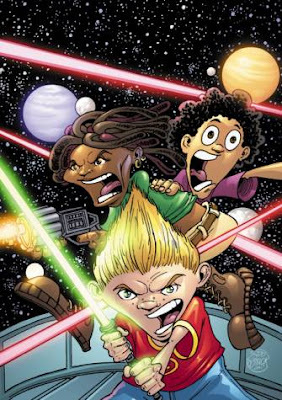 Barry Ween's universe is fast-paced and profanity-laced. Barry may have the body of a ten year boy old but he has a mouth that could make a truck driver blush or the baby Jesus cry. Imagine Seth MacFarlane's Family Guy on HBO with Stewie Griffin uncensored and unfiltered. Barry's lines although at times crude are funny, appropriately delivered, and contextually accurate. Underneath the humor, weapons, fighting, profanity, machines and monsters, the underlying message in Winick's book is about loyalty, sacrifice, friendship and relationships. Ween's universe is held together, deny it though he might, by the very randomness that he struggles against and his few bonds of friendship. After all isn't that what all our lives are about? Regardless of your IQ. 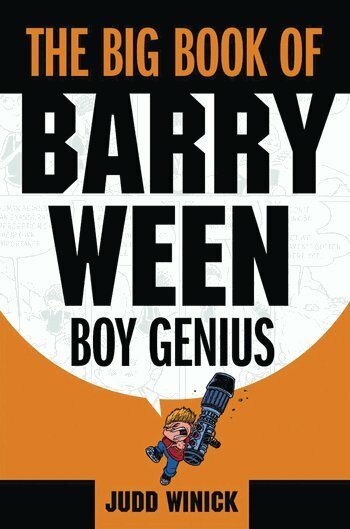 Barry Ween: Boy Genius is wonderful book. It's an easy read that will constantly make you laugh and leave you begging for more. I enjoyed these characters so much, I was actually a little depressed when the story ended and I realized there aren't any more books. The real genius is not Barry Ween but Judd Winick. Interested in checking it out for yourself? You can get the book HERE.